The Airbus A300 is a jet airliner which was made by Airbus. 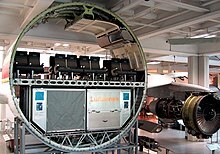 Airbus Industries launched the plane in 1972, and it was the first plane with two engines to have more than one row of seats (the first twin-engined wide-body aircraft). The A300 can hold 266 passengers in two classes. It can fly for a maximum of 4,070 nautical miles (7,540 km) when it is full, but this depends on the type of A300. Air France was the first airline to get an A300. Air France began to use its A300s on 30 May 1974. Airbus stopped making A300s in July 2007. When Airbus stopped making A300s, it also stopped making A310s. The freighter version of the A300 has been replaced by the A330-200F. In 1966, Frank Kolk, a member of American Airlines, asked for a plane to replace the Boeing 727. He wanted a plane which could hold 250 to 300 passengers, with two engines. American plane makers made planes with three engines, like the McDonnell Douglas DC-10 and the Lockheed L-1011 Tristar, because the FAA had banned planes with two engines from flying on certain routes. In September 1967, the British, French, and German governments agreed to begin designing the Airbus A300, which would have 300 seats. After this agreement, both the French and British governments were worried about the plane. The plane needed a new type of engine from Rolls-Royce, the RB207. In December 1968, the French and British companies (Sud Aviation and Hawker Siddeley) thought of a different design: the Airbus A250, which would have 250 seats. This design had its name changed to the A300B, and it did not need a new type of engine, which saved money. To get more U.S. airlines to buy the plane, American General Electric CF6-50 engines were used for the A300 instead of Rolls-Royce engines. The British government was upset and decided to stop supporting the A300. However, Hawker-Siddeley did not leave, and designed the wings for the A300. In 1972, the A300 flew for the first time. The first type of A300 to be made, the A300B2, began to be used by airlines in 1974. The A300B4 began to be used one year later. At first, Airbus Industrie did not sell many planes. However, by 1979, 81 aircraft were being used. It was the A320 which made Airbus the very big company that it is today. Autopilots which could fly the plane all the way from takeoff to landing. Wingtip fences (first used on the A310-300). The A300 did not sell very well at first. Most of the orders were from airlines of countries which made up Airbus Industrie, like Air France and Lufthansa. In 1974, Korean Air ordered 4 A300s. This made it the first airline outside of Europe to order an Airbus Industrie plane. Airbus Industrie thought that South-East-Asia was a good place to sell planes. It also thought that Korean Air was the 'key' to selling planes in that area. Airlines which used the A300 to fly on short flights needed to have fewer flights so that the aircraft could be filled, so these airlines lost customers to other airlines which used smaller aircraft and had flights more often. Eventually, Airbus had to make the A320 to rival the Boeing 737 and McDonnell Douglas DC-9/MD-80. In 1977, Eastern Air Lines leased four A300s. Frank Borman, who was the CEO of Eastern, was happy that the A300 used much less fuel than the planes the airline already had. He ordered 23 A300s. After this, Pan Am also ordered some A300s. From then on, many A300s were sold, and 878 planes were given to airlines. The body of the A300 was made longer (on the A330 and A340), shorter (on the A310), or was changed (for the A300-600ST Beluga Super Transporter). In March 2006, Airbus said that it was no longer making the A300/A310. The last A300 first flew on 18 April 2007. It was delivered to FedEx on 12 July 2007. 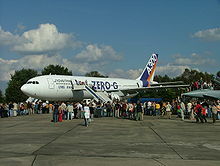 The ZERO-G A300 at Cologne Bonn Airport, Germany. Airbus A300B4-200 of Singapore Airlines at the Farnborough Airshow in 1980. Only two of these were built: the prototype, and a second aircraft. It can hold 300 passengers or 323 passengers, and it has two General Electric CF6-50A engines. The first version to be made for airlines. It had General Electric CF6 or Pratt & Whitney JT9D engines. Air France was the first airline to use it, in May 1974. The version which was made the most. The first A300B4 made its first flight on 25 December 1974. Germanair got the first one on 23 May 1975. This type's official name is the A300B4-600. It has more powerful CF6-80 or Pratt & Whitney PW4000 engines, and it has the Honeywell 331-250 auxiliary power unit (APU). The A300-600 began being used in 1983 by Saudi Arabian Airlines The A300-600 also has a different cockpit (similar to the A310), so the flight engineer was not needed for this type. This type is shorter and does not need a flight engineer. It can also be used as a military plane. It is currently being used by the Canadian Forces and German Air Force. 260 of these planes were sold, but five of these were never made. As of 2010, the A300 has had 54 accidents. There have been 26 hull-losses. 1,434 people have died on A300s. A hull-loss accident is an accident where the plane is completely destroyed, or if it is damaged so much that it cannot be fixed. Korean Air Airbus A300B4, in the Korean Air Cheju Museum. Continental Air Lines Airbus A300B4, in South Korea. It is being used as a restaurant. Mahan Air Airbus A300B4, A300B2 and A300-600 in operation. Iran Air Airbus A300-600R, A300B4 and A300B2 currently in operation. Data until the end of December 2007. ↑ 1.0 1.1 1.2 "Airbus - Historical Orders and Deliveries". Airbus S.A.S. January 2008. Archived from the original (Microsoft Excel) on 2008-12-21. Retrieved 10 December 2012. ↑ 2.0 2.1 "Airbus A300 Production List". planespotters.net. Retrieved 15 November 2012. ↑ "Aero Engines 1968: "Flight" special review". FLIGHT International 93 (3069): 19–30. 4 January 1968. http://www.flightglobal.com/pdfarchive/view/1968/1968%20-%200017.html. ↑ "The last A300 makes its maiden flight". Airbus. 18 April 2007. ↑ "Honeywell 331-250 APU". Retrieved 18 March 2011. ↑ "Airbus A300". Aviation Safety Network. 3 July 2010. Archived from the original on 17 July 2010. Retrieved 3 July 2010. ↑ "A300 TYPE CERTIFICATE DATA SHEET No. A35EU" (PDF). FAA. 2010-05-28. This page was last changed on 28 November 2018, at 21:33.